"Hey, wanna paint a hatch cover at sunrise tomorrow?" It's a question I've asked a bunch of times over the years which is usually answered with a laugh or "You're nuts." It's been too long since I hung out with Adam and some quality time was much overdue. He agreed to meet on Alki Beach at 5 AM the next morning. We both showed up surprisingly bright-eyed and had an amazing morning. 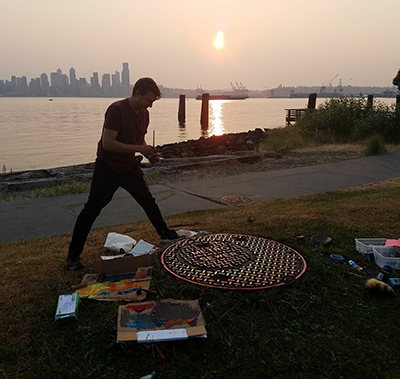 The smoke from forest fires in British Columbia had been rolling through Seattle for the past week making the morning sun glow red as it rose behind the city. 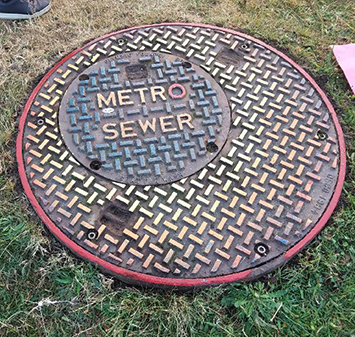 We found this interesting "Metro Sewer" cover directly across the bay from downtown Seattle. It has an outer circle with another circle placed at the opening or actual entrance and reads "Metro Sewer." Since it's early days, Seattle waste and drain water used the same system. Wastewater flowed into Lake Washington and Puget Sound and many rivers and smaller lakes without enough treatment, fouling water and making a sullied mess of local beaches. In 1958 the voters created Metro and developed a regional wastewater treatment system based on watersheds as opposed to political boundaries. They began work in two new treatment facilities and y the late 1960s, regional water quality began improving dramatically. 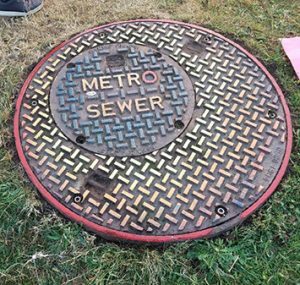 Metro Sewer operated until 1994 when King County assumed authority. Since then, they have made huge strides in treating and providing clean water all over King County. Finding this beautiful cover right along the shores of the bay was a stark reminder that we are all part of one big cycle. What we dump down our sinks, in our yards, and on our streets will eventually make it's way back to the water. The same water we use to eat, drink, and live. As the orange glow of the sun starting rising above the city, we tried to emulate the beauty of the moment with the colors we chose. 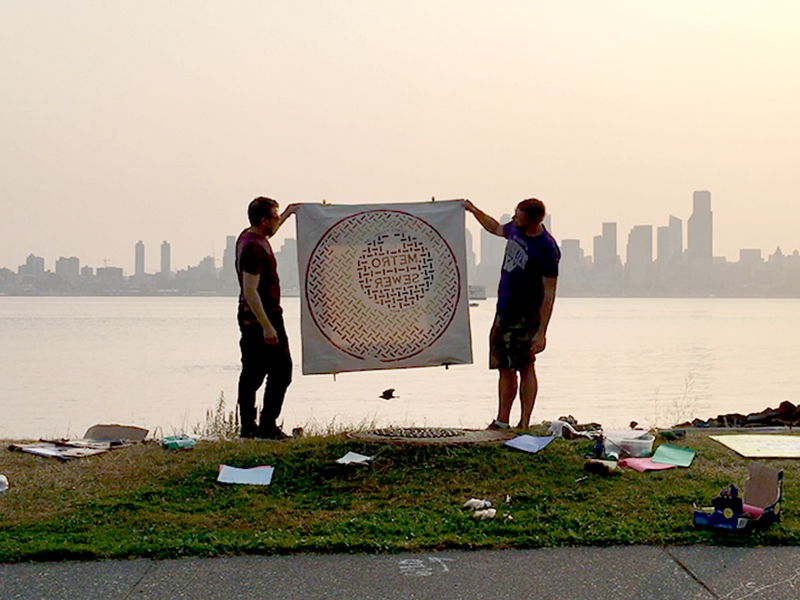 Two hours, one police interaction, and a group of harbor seals later... we pulled the print. It came out better than planned and we spent the the next hour basking in pure satisfaction. The circle inside a circle inside a circle, the colors we choose, and the amount of ink that was transferred to the canvas was perfect. Yes, we made a sweet print from an awesome cover, but the real gem of the day? Catching the sunrise and enjoying the morning with a good friend.